The Job Expo will begin at 10 am in the Verl Petsch Jr Activities Center Gymnasium at the College, and will continue until 2 pm. Attendees should come prepared with a resume and be prepared for an interview. Currently registered participants include Adams Land and Cattle, LLC; Animal Clinic of Rapid City; AXA Advisors, LLC; Black Hills Energy; Compression Leasing Services; Goshen County School District #1; Goshen County Weed and Pest; Goshen County Healthcare Community; Heritage Estates; Knife River; Mountain View Veterinary Hospital; Peabody Powder River Services, LLC; Platte County Legacy Home; St. Joseph’s Children’s Home; State of Wyoming; The Animal Center; Wyoming Child & Family Development, Inc; Wyoming Medium Correctional Institution; Goshen County Sheriff’s Office, and KNEB. There is still an opportunity to register your business or company to participate. Please contact Jo Ellen Keigley at 307.532.8288 to register or for more information. The Workforce Development office at Eastern Wyoming College in Torrington is offering a CPR/First Aid/AED/BLS class on Wednesday April 25 from 5:00-9:00 pm. This course is designed for medical personnel for initial or renewal of certification. This class will be held in the CTEC building on the main campus in Torrington and will cost $60 for the CPR/First Aid/AED training and $55 for the BLS training. To register for this class or other classes, contact Donna White at the EWC Workforce Development/Community Education office at 307.532.8323. On Tuesday afternoon, college officials, state officials, and EWC’s architect opened up the bids for the College’s Agricultural Technology Education Center (ATEC). There were 4 bids received on the project with a low bid of $8.4 million up to a high bid of $ 9.2 million. The budget for this project is $7.9 million. “We have received a tremendous amount of support from the Goshen County community for this project and we want to keep the community well-informed about this process,” added Dr. Travers. The architect will now begin the process of reviewing and validating each bid. The College will also be working with the Economic Development Agency (EDA) as they will also be reviewing the bids to comply with the grant the college received for the facility. It is anticipated that the review process by the various agencies and individuals could potentially take up to 3 weeks. EWC will then have a better idea of options. Identify: Students are identifying breeds, equipment and parasites. The Eastern Wyoming College Agriculture Department hosted the State Veterinary Science CDE on March 19, 2018 with over 150 FFA members representing 39 FFA chapters from across Wyoming. The contest consists of four different components. The first is a 200 point written exam where individuals are tested on many topics ranging from disease, nutrition and patient management to conversions and dose calculations, and everything in between. The second section is an individual ID exam covering equipment, parasites, and breeds of companion animals and livestock. Next, individuals are asked to complete a handling and restraint hands-on practicum, as well as a clinical procedures practicum. Last, all team members come together to complete a team activity. The top placing team will represent Wyoming at the National FFA Convention in October. “The Vet Science CDE requires students to study a variety of topics that are beneficial to individuals involved in production agriculture and the veterinary industry alike. This contest is very applicable in the real world and we all enjoy seeing so many high school students participating in this contest,” stated EWC agriculture instructor, Kaitlyn Steben. The 2018 contest was organized by Dr. Monte Stokes, Division Chair and Agriculture Instructor, Dr. Georgia Younglove, Agriculture Instructor, and Kaitlyn Steben, Agriculture Instructor. A special thanks to the many volunteers who helped during the contest: Rick Vonburg, Mai Lee Olsen, Wendy George, and 21 EWC students. The EWC Ag Department will host the State FFA Range Contest in October, 2018. The Eastern Wyoming College Lancer rodeo team just concluded hosting their hometown rodeo and finished the weekend with the women’s team earning a first place finish with 340 points. The men’s team finished in 3rd place with 415 points. Jacey Thompson, freshman, Yoder, WY, led the women’s team with a 1st place finish in the goat tying. She won the first round with a time of 6.6 seconds and won the short round with a time of 6.8. Thompson’s win moved her to the top of the Central Rocky Mountain Regional standings with 595 points, just three points ahead of teammate Karissa Rayhill with 592 points. Rayhill, a freshman from Martin, SD, placed 3rd in the average with a total time of 14.6 seconds on two. She was 2nd in the short round with a time of 7.0. Teammate Libby Winchell, freshman, Scottsbluff, NE, placed 4th in the first round and 6th in the average. In the barrel racing, Rayhill finished 6th in the average. The sophomore team roping team of Braden Pirrung, Hartford, SD and Riley Curuchet, Kaycee, WY, captured 1st place in the team roping with a total time of 14.5 seconds on two. The duo won the first round and placed second in the short round. Teammates Bryer Wadhams and Trevor Schnaufer, both from Pueblo, CO, placed 5th in round one. Wyatt Schuelke, sophomore, Faith, SD, placed 6th in the first round of the steer wrestling and 4th in the average. In the tie down roping, Levi Walter, sophomore, Wray, CO, qualified for the top 10 short round. The Lancers will compete at the Colorado State University rodeo April 6-8. A statewide tour of Wyoming’s community colleges starts this week to bring funding and business assistance resources to entrepreneurs, inventors and innovators. 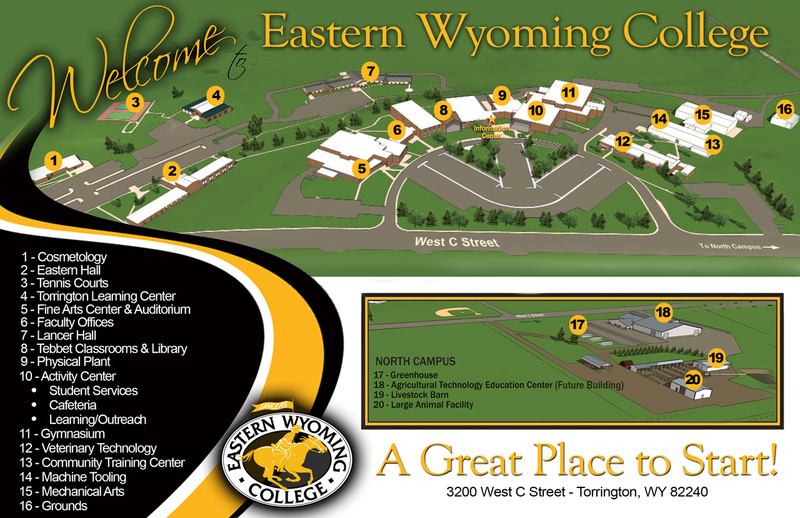 The first stop of the Wyoming Innovation Road Tour will be at Eastern Wyoming College on Wednesday March 28 from 1-3 pm. This series of events will deliver information about programs available to fund technology advancements and will also provide an opportunity to meet with successful technology entrepreneurs in Wyoming. The Wyoming Innovation Road Tour focusses on funding available through the Small Business Innovation Research (SBIR) and Small Business Technology Transfer (STTR) programs. Successful applicants can receive $500,000 to $1 million to bring their products to market. The Wyoming SBIR/STTR Initiative (WSSI) is available to Wyoming residents to help them get a piece of the $2.5 billion offered by the federal government through these grants each year. Attendees will also be able to receive commercialization assistance from the Wyoming Small Business Development Center (SBDC) Network, the U.S. Small Business Administration and other University of Wyoming and Wyoming Business Council partners. Hear about the personal experiences of Wyoming technology entrepreneurs who have found success through these programs. Presenters include Robert Viola, Co-Owner of Square One Systems Design; Kristin Di Bona, Founder & CEO of Wyomincs, LLC; Robert Lumley, Founder of AirLoom Energy and many more. Presenters will vary by location. To register or get more information, go to WyomingSBDC.org and click on the Wyoming Innovation Road Tour link on the homepage or contact Kelly Haigler Cornish at haigler@uwyo.edu or (307) 766-2904. WOMEN, LADIES, GIRLS: take responsibility for preparing yourself in the event of a crime—the more prepared you are, the less likely you will need to defend yourself. This class is designed to increase your personal level of awareness, thus reducing the chance you will find yourself in a compromising situation, whether it be at home, in a parking lot, or out jogging. Basic self-defense techniques will be demonstrated with opportunity for practice. Even if you’ve taken this class before, it is always to your benefit to refresh or practice your self-defense skills. Class instructor Officer Reed has updated the class curriculum to include the use of pressure points as a self-defense technique. This class will be held on Thursday April 19 from 6:30-8:30 pm and the cost is $20 per session. The Community Education office at Eastern Wyoming College in Torrington is offering an Introduction to American Sign Language class. This class will be held on Tuesdays, April 3 through May 1, 2018 from 6:30-8:00 pm in CTEC 210 and the cost is $40. American Sign Language (ASL) is a natural language that serves as the predominant sign language of deaf communities in the United States and most of Anglophone Canada. EWC student, Jaxon Heyrend, is excited about sharing his knowledge of American Sign Language. He has planned some creative and innovative activities to make learning this language fun for everyone. In this four week class Jaxson will cover alphabet, numbers, basic phrases, basic nouns and some verbs, as well as information about the “deaf culture”. Parents and grandparents, sign language is a great way for you to communicate with your little one because babies’ understanding of language and motor skills develop much faster than their ability to speak. Learning signs such a drink, food, hot, and more may lead to less frustration and tears. To register for this class or others, contact the EWC Community Education office at 307.532.8323 or stop by 3200 West C Street in Torrington. Eastern Wyoming College Men’s golf signed Eric Stevens, from Bridgeport High School, in Bridgeport, NE. “I’m excited to add Eric to our team next year. He is a long hitter that loves to play the game. He also performs very well in the classroom which will help him obtain an Ag degree from EWC. I’m anxious to follow his progress during his senior year of golf at Bridgeport High School,” said Zach Smith, Men’s Head Golf Coach.